← Part #3901-A Zenith/Bearhawk Stainless Exhausts, now on shelf. Front Alternator Belt, Part #2904, new source. In our conversion manual, (http://shop.flycorvair.com/product/conversion-manual/) , The front alternator group is #2900, and the belt itself is Part #2904. In the manual we specified a Continental AVX10-710 belt. A number of people have asded about another source, as Conti, now lists their number as obsolete, and people had a hard time at their local auto parts store getting an interchange. The issue is that most countermen don’t know enough about the parts they sell. Conti is a German company, and the “10” in their part number is 10mm wide, and in the US that is a 25/64″ width belt. “710” is the pitch length in mm’s, which is pretty close to 28″. 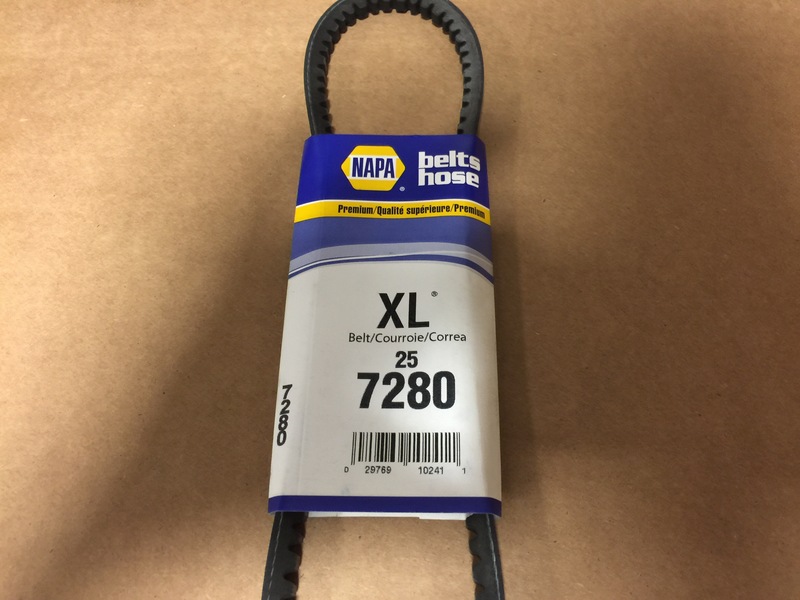 The belt pictured below, available from any NAPA store, is a valid interchange. Please write this note in your conversion manual. Above the correct replacement belt. This has been verified to work on a Gold hub, with a Front Alternator bracket set and a front alternator. 2 Responses to Front Alternator Belt, Part #2904, new source. It is a Gates number also. Gates 7280. Thanks for this. I had chased down numerous leads for this to no avail. I was almost to the point of having to learn german and befriending helga, to swipe the one off her porsche. Getting the one at NAPA will be much better.